Power Supply Units (PSUs) are an often overlooked part of a PC system build. While central processing units (CPUs), graphics processing units (GPUs) and solid-state drives (SSDs) regularly command more attention, it's hard to ignore the fact that the PSU is arguably your PC's most important bit of hardware. Why? Because a high-quality supply often outlasts other components and can be used in subsequent builds. This simple-looking box is tasked with serving up a reliable supply of power to all of your PC's components, and without it, your PC simply wouldn't work. PSUs work by converting general-purpose alternating current (AC) available from the mains, which is 230V here in the UK, to low-voltage direct current (DC) power that's better-suited to your PC's hardware - generally 3.3V, 5V and 12V. That DC power is then routed to various PC components to give them the electrical juice required to run. Sounds simple enough, but the importance of the PSU is such that its reliability and efficiency should not be overlooked. In this Tech Explained, we'll describe which features to look for when purchasing a new power supply, and we'll aim to bust a few myths along the way. The ATX (Advanced Technology eXtended) standard, introduced by Intel in 1995, has governed the way in which power supplies have evolved in recent years. Launched as an improvement over the previous AT (Advanced Technology) standard, ATX requires the power supply to produce three DC power outputs; +3.3V, +5V and +12V, and features two major design alterations. Unlike AT-based computers, where a chassis' power button was connected directly to the PSU, ATX introduced a system where the chassis' power-switch is connected to the motherboard via a wire typically labeled Power SW - allowing other hardware/software to wake the machine. In addition to this change, the power supply's primary connection to the motherboard was changed to a large, 20-pin, keyed connector to prevent any potentially-hazardous mix-ups. Important enhancements back in 1995, but things have since moved on. In 2003, the then-new-and-improved ATX 2.0 standard re-evaluated the way in which power is distributed by specifying that two independent 12V rails should be used with independent over-current protection to power most of a PC's components. In addition to this important change, ATX 2.0 saw the motherboard power connector extended from 20 pins to 24 pins - with the additional four pins providing another 3.3V, 5V and 12V circuit - and introduced a requirement for all power supplies to feature at least one serial-ATA power cable for use with modern storage devices. ATX 2.1, announced in 2005, added dedicated 75W, 6-pin power connectors for power-hungry PCIe graphics cards, and was promptly followed by another minor upgrade - ATX 2.2 - that introduced 8-pin PCIe connectors capable of delivering a meatier serving of 150W for beefier graphics cards. A recent revision, ATX 2.3, dates back to 2007 and requires all power supplies offer at least 70 per cent efficiency, with an optional recommendation of at least 80 per cent. You've already heard the word efficiency mentioned in this Tech Explained, but exactly why is it so important for a PSU? Let's look at a real-world example. If a power supply is rated as 70 per cent efficient, it would require 200W of AC power in order to create a 140W DC output that's fed to the components. The remaining 60W (30 per cent) is wasted in heat, and the heightened temperature can result in more noise as the PSU fan speeds up to keep the unit cool. And, as a general rule, higher temperatures are detrimental to long-term component longevity. Using a similar example, a 90 per cent efficient power supply could produce the same 140W DC output by drawing only 155W of AC input - resulting in just 15W of waste. Less waste equals less heat produced, and of course lowers electricity bills. As a real-world example, requiring 200W DC, eight hours a day, five days a week, 52 weeks a year, would mean an 80 per cent efficient PSU would need an extra 58 kilowatts over a 90 per cent efficient supply. Priced at 20p per kilowatt-hour, that's a saving of over £10, which increases as PSU load is heightened. Run a coin-mining computer chewing through 1,000W and the saving jumps to a not inconsiderable £58 on a single PC. Enermax, for example, has an online calculator that works out potential cost based on load. The higher the power-supply efficiency, the better, but it's important to note that efficiency can vary at different workloads. Using the efficiency graph of an Enermax Platimax 80 PLUS Platinum-rated power supply, below, we can see that the unit is most-efficient when a load of between 40 and 60 per cent is applied. As a result of the reduced efficiency at low loads, it's important to match the power supply rating to the needs of your computer. For example, using an Enermax Platimax 1,000W PSU unit to power a system that typically consumes around 100W (representing an approximate 10 per cent load) would not be optimal, though such is the engineering excellence that, even at such low loads, efficiency is over 90 per cent. Generally speaking, optimum efficiency can be found by ensuring the rated capacity of a power supply is approximately 50 per cent more than the typical consumption of the computer. If the computer consumes 300W, a 450W power supply may offer peak efficiency. A useful rule of thumb, but note that the efficiency curve will vary from manufacturer to manufacturer. To help make it easier to identify the most-efficient units, keep an eye out for the 80 PLUS logo - it certifies units that are at least 80 per cent efficient at varying workloads. All power supplies are given a maximum power output rating, but exactly how much power you need will be dependant on your PC's components. For a modern mid-range system (i.e. a typical home computer) power supplies ranging between 300W and 500W should be plenty sufficient. Gamers and enthusiasts - who often use powerful discrete graphics cards - are more likely to use power supplies rated up to 800W, and extreme users - who may have multiple graphics cards or multiple CPUs - can find power supplies rated in excess of 1,000W. It's important to note, however, that the power-output rating is not officially certified and is often a manufacturer-proclaimed number that can come in two very different forms: peak and continuous. If a power supply claims a 400W continuous output, it is able to constantly provide that much power. In contrast, if a power supply claims a peak output of 600W, it will only be able to provide that much power for a short period of time and will likely deliver far less in real-world scenarios. Despite the lower power rating, the PSU claiming 400W of continuous output would be the better choice in this example. Remember, also, that a PSU will only use as much power as it needs. Buying a 500W PSU doesn't mean that your PC will consume 500W at all times - it will only use what the PC calls for! Modern applications have put renewed focus on PSU capacity. An example of one is coin mining, where a bunch of graphics cards are housed in a single system and their general-purpose compute capability is used to digitally mine for coins that, at the moment, have a high resale value. The last few months have seen multiple AMD graphics cards shoehorned into a system that requires 1,000W-plus of DC power. Companies such as Enermax have numerous supplies that deal with this kind of continuous load with utmost stability. What about multiple 12V rails? If you already know a thing or two about power supplies, you'll be aware that manufacturers and users have in recent years been touting the benefits of either having a single 12V rail, or multiple 12V rails. Trouble is, if both of them are said to offer benefits, which allocation of rails is right for you, and why did we go from single to multiple in the first place? The answer is simpler than you'd think. With modern-day components placing a greater demand on the 12V rail, Intel's ATX specification was amended to suggest that PSUs should feature two 12V rails with independent over-current protection for safety reasons. By limiting the flow of amps in each rail, there's less chance of wires becoming dangerously hot. Multiple rails are a good idea, then, but unfortunately for Intel's specification, a few poorly-constructed power supplies gave multiple rails a bad reputation that continues to linger. Instead of separating PCIe connectors across multiple rails, some PSUs were found to feature all of their available PCIe connections on one rail - resulting in an overload when multiple components were attached, ensuring an automatic shutdown. Fortunately, that inappropriate layout is becoming a rarity, and most PSUs, such as the Enermax line, feature one 12V rail solely for PCIe connectors, and another for the PC's other components. The bottom line? For the vast majority of users, there's no perceivable difference between a single- or multiple-rail PSU. What's of greater importance is the PSU's range of connectors. Power supplies come equipped with a variety of integrated connectors, but there's no standard selection and you'll need to ensure that your chosen PSU has all of the connections required for your PC. ATX motherboard power connector. This 24-pin connector provides a PC motherboard with power, and it's backward-compatible, too, meaning it'll work just fine on an older motherboard with a 20-pin port. ATX12V/EPS12V power connector. This connector is used to supply power directly to a PC's processor. The 4-pin ATX12V connector is common to most power supplies, but the 8-pin EPS12V connector is available on high-end units for motherboards and processors that require considerably more power. Serial ATA power connectors. These compact cables are primarily used to power storage devices - ensure you have enough of them for all of your optical drives and hard drives. 4-pin peripheral power connectors. These Molex cables are used to power a variety of components ranging from hard disks to system fans, but have been used less frequently since the arrival of SATA. Floppy connector. A small cable that provides power to a floppy drive. 6-pin PCIe connector. Introduced as part of the ATX 2.1 specification in 2005, this connector is generally used to supply power to powerful graphics cards. 8-pin PCIe connector. Commonly configured as a 6+2-pin connector, this provides more power to high-end graphics cards and can be used with both 6-pin and 8-pin products. As far as connectivity is concerned, the easiest way to ensure you have all bases covered is to opt for a power supply with more connectors than you're ever likely to need. Seems like a good idea, but all that cabling is going to introduce more clutter to your PC, and it may obstruct your chassis' airflow. One workaround is to opt for a modular power supply that allows users to attach only the cables they intend to use. 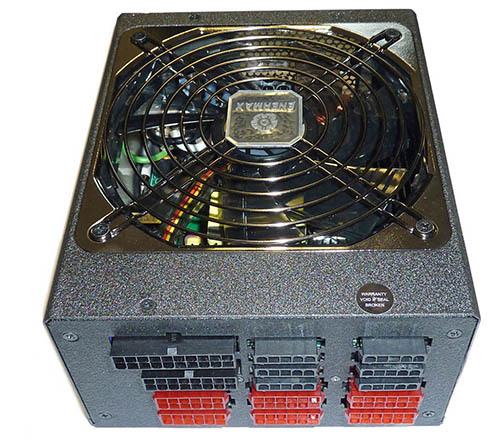 Unlike non-modular PSUs that have a grouping of cables connected to the unit at all times, a modular power supply (such as the Enermax Platimax 1,200W, pictured above) features an array of ports to which cables can be easily attached. A wide range of cables are typically bundled with the unit, and the cables are often available in different lengths - making it easier to choose the right cable for your chassis. Modular PSUs are undoubtedly neater, but be warned, they're normally more expensive than their non-modular counterparts. EuP / ErP (Energy-using Products) is a European Union directive that "establishes a framework under which manufacturers of energy-using products will, at the design stage, be obliged to reduce the energy consumption and other negative environmental impacts that occur during the product’s life cycle". For personal computers, it aims to ensure that the total system power consumption does not exceed 1W when turned off or placed into standby. In order to meet the directive, you'll need to ensure your motherboard and PSU are EuP / ErP compliant. 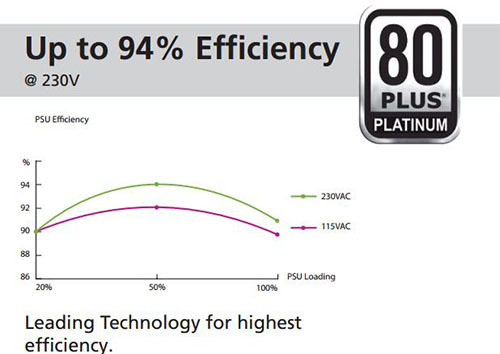 With regards to efficiency, from July 1, 2014, all PSUs sold within the EU need to be at least 80 PLU Bronze efficient. This means having at least 85 per cent efficiency at 50 per cent load and at least 80 per cent efficiency at 20 per cent and 100 per cent load, respectively. ATX PSUs typically measure 150mm x 86mm x 140mm in size, but the depth can vary depending on brand, and if you're working with a small-form-factor chassis, you'll be happy to hear that mini-ATX and micro-ATX, SFX and TFX power supplies are also available. Firms such as Enermax have considerable experience in producing the smallest, most efficient supplies at a particular wattage. 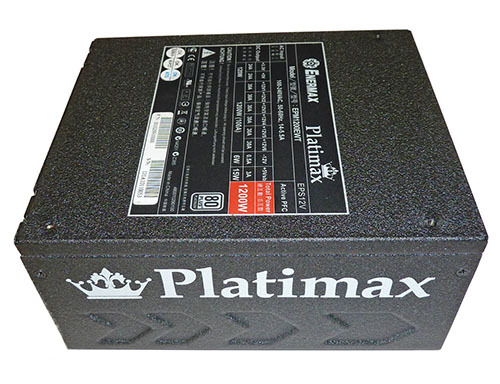 The powerful Platimax 1,500W PSU is just 180mm deep, compared to over 200m for rivals, and low-wattage models such as the Triathlor ECO (350W-600W) are just 140mm deep. Not all PSUs are created equal. The best supplies have low ripple (caused by the AC current being transformed into PC-compatible DC), low internal noise, high amperage on the key lines, and high-quality capacitors, preferably Japanese, that should last longer than cheaper ones. Newer supplies also feature what is known as a hybrid-fan mode, where, due to high efficiencies, the unit's fan doesn't even need to switch on until, say, 40 per cent of its capacity is reached. There's more to a PSU than meets the eye, isn't there? In addition to everything we've mentioned thus far, keep an eye out for sleeved cables (they help keep your PC looking tidy), a large, well-positioned fan (it'll help keep your PSU running cool, and larger fans are typically quieter) and a mean time between failure of at least 50,000 hours (a higher MTBF suggests that your PSU will live longer). Also, PSUs rated to deliver their stated continuous wattage at a high ambient temperature - 50°C, for example - are likely to last longer, as it's more difficult to sustain a continuous flow when components become warmer. Opting for a well-respected power-supply brand such as Enermax will stand you in good stead, and remember, always take the time to check reviews at reputable online publications. A wide range of Enermax PSUs are available from Scan.co.uk and Overclockers.co.uk. For full disclosure, this Tech Explained is sponsored by Enermax. What's the difference between bronze to platinum ratings on PSUs? A clear explanation of that is missing from the article IMHO. The ratings refer to the “efficiency” of the PSU (i.e. how much of the electricity is used to provide your components with power, rather than being “wasted” as heat). You'd have to Google it, but basically each unit offers x % power efficiency at x % usage. So the better the efficiency, the higher the rating (starting from bronze to silver, gold and platinum). No idea what the ‘numbers are’ tho. They may have figured it out in the intervening four years.